Wednesday, March 6th, 2019, 6:30 – 8:30 pm. This husband and wife combo has worked with five different agents between them and been offered agent representation fifteen times. Beginning with manuscript polishing and submission requirements, they will proceed to discuss websites such as querytracker.net and agentquery.com. They will touch briefly on query letters and the synopsis, wait times, and what to expect while querying, proceeding from there to what to do when you receive “the call,” and what happens after you sign with your dream agent. Last, they will address what happens if things do not work out between the author and agent and how to part ways amicably. José Pablo Iriarte is a Cuban-American writer and teacher who lives in Central Florida. 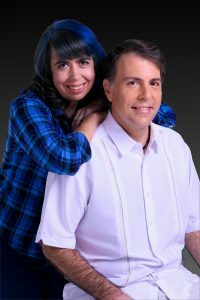 José’s fiction can be found in in magazines such as Lightspeed, Strange Horizons, Fireside Fiction, and others, and has been featured in best-of lists compiled by Tangent Online, Featured Futures, iO9, and Quick Sip Reviews, and on the SFWA Nebula Award Recommended Reading Lists for 2015, 2016, 2017, and 2018. Learn more at www.labyrinthrat.com, or follow José on Twitter @labyrinthrat.